Hands on + Braiding: 30 min. Total: 4 hrs. 40 min. I know we all appreciate your hard work on this recipe. Can’t wait to make it a part of our Christmas celebration!! Do you hang foil wrapped chocolates on your Christmas tree? Thank you so much for all the great recipes and the easy and fun way you (and Steve) present them. Have a merry Christmas and we wish you a healthy, prosperous new year. Christina, what a great video. I think the portioning and braiding was the hardest part. Thanks so much for the detail. Mele Kalikimaka! Thank you, glad you liked it. 🙂 Yes, those were the hardest parts for me to figure out. Are you in Hawaii? Merry Christmas! 🙂 Thank you Tom and Simona for your nice comment. 🙂 That is very sweet of you Tom to cook for your girls. Thank you for the recipe! Made it tonight, first time try & turned out to be very nice. My husband & son love it:) Merry Christmas! That is great to hear. Thank you for your feedback. I am glad you all enjoyed it. 🙂 Merry Christmas! Thank you !! What a success – this year’s Vanocka was the best I have ever made. I have tried so many times to achieve same lovely bread as my Czech mother-in-law used to make. But between confusing volume vs weight conversions, and differences in flour, I was never really pleased with the end product. Now I have a perfect recipe and a video, no less. Guaranteed results!! Thank you for doing this. I’m getting ready to make this right now! Hi, I am very excited to find this recipe. My great-grandmother came to America from the-Czechoslovakia (in the original Bohemia) in the early 1900’s. She and her husband had a restaurant and bakery in New York until they retired in southern California. I was fortunate enough to enjoy her cooking as a child until she passed at 106 years old. I have always said that she could turn a bag of sand and a brick into something delicious, but this bread was always something I looked forward to (her dumplings too!). I have tried to make it in the past, but it always comes out too flat. Do you have the instructions written out somewhere? It is easier to refer to in the kitchen. So I made your recipe last year and it turned out awesome! Just made one tonight and although it raised up nicely before it baked, while it baked it sort of spread out a bit and lost some of the braided look. Any thoughts? Hi Carla, that sometimes happens. This year I baked for the first time at my parent’s oven, that I am not familiar with at all and it all fell down even though it was braided nicely and at my home it comes out always amazing. It could have been either yeast or the oven. secure vanocka before baking with toothpicks. Also on each part of braids, make u with your roling pin, before you put on the second braid, and same before putting the 3rd one, and let the vanocka raised again before baking. After several years, I made your recipe in December and it was wonderful. I much prefer King Arthur Bread Flour in my bread recipes; it has greatly improved the quality of the bread I make. I cut the loaves into half to make sure they cook well in the thickest part; yes, they do spread–suppose a foil collar would help this some. Glad to hear you liked it. 🙂 You could also make two smaller ones, which works nicely as well. Jee, to je paradni! To mam radost, ze tak chutna. 🙂 Krasny den a Vesele Velikonoce! I am sorry to hear about your husband and his allergies. 🙁 I am not experienced with gluten free flour so I am not able to give you suggestions. But I would love to work on gluten free version of Vanocka in the future. 🙂 Many greetings to Prague! I follow so many of your recipes! My husband is Czech, so I always try to make him his tradition cuisine. My question is, “Can I store the Vánočka in the fridge after braiding and then bake in the morning? Thanks in advance! Hm, I have never tried it. Theoretically it could work since the cold will stop the rising. I would braid it and put into the fridge right away. In the morning it will need to wake up and maybe rise some more. If you try it please let me know. 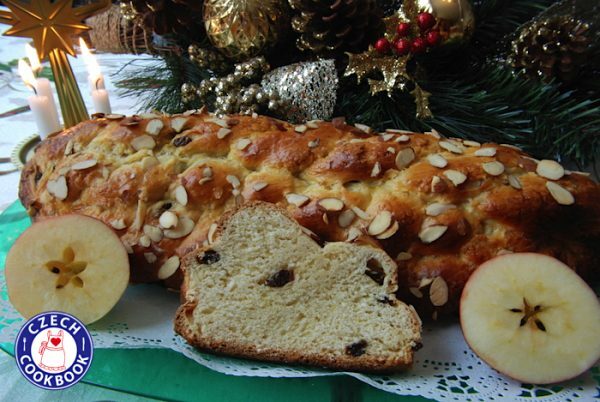 What is the difference between a Hoska Christmas Bread and Vánočka Christmas Bread. Many centuries ago this bread was called Houska. These days it is called Vanocka from the word Vanoce. Houska these days is small braided salty bread. Kristýna – thank you for these wonderful recipes and the fantastic videos. I am half Czech, and I grew up knowing this sweet braided bread as houska from my grandparents. My děde, who arrived in NY in 1923 when he was 24 years old, was born in Polšnik (which is in what was then Yugoslavia and now Slovenia), and my Babi is from Mistřín and arrived in the US when she was 26. My prateta moved here when she was much older and never learned English. She brought me a beautiful Czech doll in a traditional Moravian dress; I still have her. My father didn’t speak English until he learned in school, and Czech was spoken whenever we were with my grandparents. This discussion about houska & vánočka came up a few years ago when I mentioned making houska (vánočka) to a Czech friend here in NY. Another friend from the CR actually took photos of houska at a market to show me as proof that houska is savory and not sweet . I just can’t get used to calling it vánočka, having grown up knowing it as houska lol. I even have my babi’s recipe, handwritten by my father, and it says “houska”. My prateta came here in the 1970”s and she also said “houska” for the sweet, braided bread. We are dinosaurs, my family – really clinging on to the old name for this Christmas bread . I also have the family recipe for knedlík. It means a lot to me to have these recipes from my babi, prateta, and father now that they have all passed away, and finding this site with so many traditional Czech dishes that I never got the family recipes for made me so happy! Děkuji moc! Traditionally we would put only raisins in. Easter bread which is almost identical to Christmas bread would usually have candied fruit. Kristynko, uz jsem jich upekla hodne, ale nikdy nebyla takova vlaha jako ta tvoje. Definitivne je to tim ze jsi prizpusobila ingredience severoamerickym – zijeme v Kanade. Moc dekuji za idiot-proof recept. Tento rok planuju jich napect nekolik a podarovat sousedy. Jiny recept uz nehledam, budu pouzivat jen ten tvuj. Zjistila jsem ze ta vanocka je snad jeste lepsi den po upeceni. Taky jsem musela na nakup, kdyz uz byla zapletena, a zpozdila jsem se o vice nez hodinu, takze kynula pres dve hodiny – a to bylo stesti, protoze stridka byla krasne lehoucka. Nekde jsem se docetla proc se vlastne pletla z tolika pramenu: ctyri spodni prameny reprezentuji slunce, vodu, zemi a vzduch, prostredni tri rozum, vuli a cit, vrchni dva lasku a vedeni. Prameny se krizuji aby ochranily rodinu a blizke pred zlymi vlivy. Jeste jednou dekuji a preji krasne svatky vanocni a mnoho zdravi a stesti do noveho roku! I have been making Vanocka for many years … at Czech rep. and here in Canada …. I never used tinfoil to cover it while baking. So tried this time and it did turn out great. Thanks for the idea. This was so helpful!!!! And it turned out amazing! I need to work on the braids but the fact that they weren’t perfect didn’t take away the beauty of the loaf! My sister’s husband is Czech and makes so many cookies and delicious foods every year; a very traditional man. I am going to surprise him with this for Christmas breakfast! Thank you so much for this video- I am a visual learner, and I felt like I was baking with a friend!!! Veselé Vánoce a šťastný nový rok! Hi Krystyna, I just made my first vánočka using this recipe this afternoon. It turned out great and it’s nothing like the ‘not that great’ store bought ones here in Prague. Half of the vánočka is now gone *lol* Thank you for sharing this recipe. Šťastný nový rok!